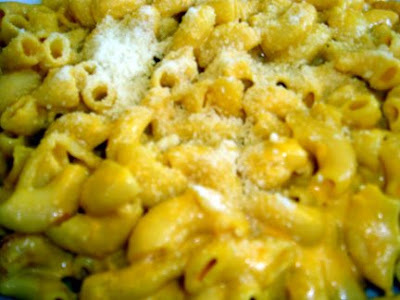 One unexpected benefit of doing a blog about macaroni and cheese is that, when people hear about it, they eagerly recommend their favorite restaurant or recipe. And we, naturally, are happy to chase down these leads! I live in the South Bay part of Los Angeles and one name I kept hearing from neighbors was Ocean Diner in Hermosa Beach. I’ve driven past this cute little place hundreds of times without noticing it, but I’m glad I know about it now because I am still thinking about the menu three days later. Ocean Diner is one of those beachy, relaxed places with a retro feel, sort of like Ruby’s before they went corporate. 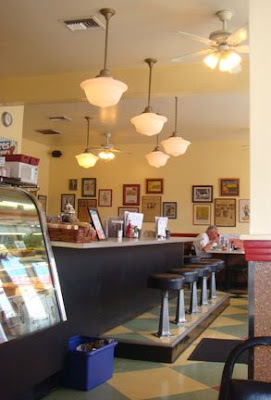 The small space is enhanced with 1940s big band music and a sizable collection of vintage toasters. I settled into a table by the window but the best seats in the house are probably these adorable stools at the counter. 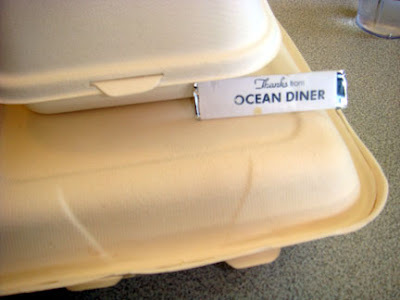 A glance at the menu confirmed that Ocean Diner covers the typical array of comfort foods – meatloaf and chicken fried steak are among their specialties. But there’s also a health-conscious vibe; many dishes incorporate brown rice, stir fry veggies and a warm ginger soy glaze in places I didn’t expect, like omelets. (An extensive breakfast menu is served all day.) The omelet that caught my eye, topped with chile verde pork, was playfully rechristened “Rattlesnake Omelet” and the kids’ menu features a “Mashed Potato Sundae” topped with chicken fingers and scalloped corn. I believe that when a menu item shares your name, it’s your duty to investigate, so one day soon I will go back to try “Suzy’s Crunchy Fried Toast,” which is rolled in their “almost famous” house-made granola, dusted with cinnamon and topped with bananas. “Gail’s Salad,” with grilled chicken, roasted beets, hard boiled egg, blue cheese and spiced walnuts, sounds amazing too, if your name happens to be Gail (or even if it doesn’t). 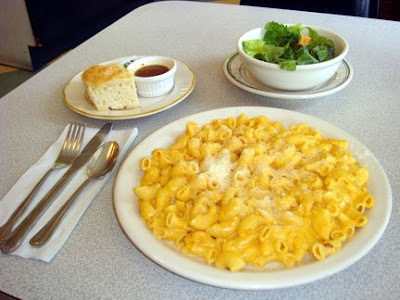 But on this day, of course, I had one objective: the highly recommended macaroni and cheese. I have to say, my feelings about it are deeply conflicted. For one thing (and Hilary would have fainted dead away, had she been there), it’s orange. This generally does not bode well. Ocean Diner’s M&C appears to be the stovetop variety, not baked. I can roll with that. The macaroni in question is the big-mama elbow variety, and I’m 100% in favor of that because it lets more sauce hide inside each noodle. I even applaud the way the pasta was ever so slightly overcooked because its tenderness just amplifies the comfort factor. The sauce is a good consistency, ample and not stringy or greasy at all. But other than the sprinkling of parmesan on top, I am completely unable to identify any particular cheeses that are involved except to say that, clearly, one of them is orange. There’s just no tang, no zing. The food came rather unceremoniously plopped onto a regular dinner plate, just a big orange puddle. The more I ate, the blander it seemed, and I stopped after consuming only about a quarter of it because it was boring to eat and growing cold. I generally prefer my mac and cheese without any extraneous ingredients, but in this case I probably would have been happier had I ordered the alternate menu item called “Wanda’s Mac and Cheese,” which adds crispy bacon and diced tomatoes to alleviate the ennui. Clocking in at about $10, the dish came with a house salad of dark leafy greens, diced tomatoes and cucumber, croutons and a tasty house-made lemon basil balsamic vinaigrette. The best part of the meal, by far, was the biscuit. This odd but delicious little fellow was cut on all four sides, suggesting it had been hewn from a slab of biscuit-mother (as opposed to the rough edges that result when biscuits rise and merge while baking). Despite its unusual appearance, this biscuit was outstanding: tender, moist, fluffy and not so crumbly that you lose half of it in your lap. Reluctantly, let’s return to the main course. I can see why so many people think it is terrific, because it’s definitely reminiscent of the mac and cheese most of us grew up on: The Blue Box. 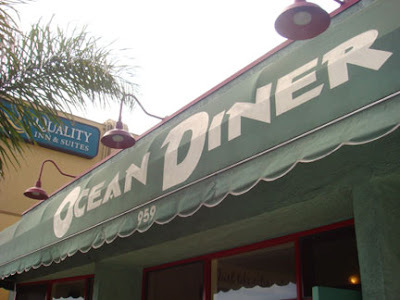 In fact, Ocean Diner’s dish is sort of a more sophisticated version of that stuff, with its sauce that, though silkier and more abundant, is still radiantly, reassuringly orange and utterly vague in terms of actual cheese flavor. So, I cannot entirely recommend the plain version of this macaroni and cheese, unless you haven’t quite graduated from Kraft. However, I’ll definitely return to Ocean Diner soon. I enjoyed the atmosphere, the service was good and I appreciated the nice touch of the custom-stamped, old-skool stick of gum that arrives with your bill. But next time, I’m having the meatloaf.